because I couldn't figure out how to format them. Then Matthew taught me how to use PowerPoint to make the photos into a grid, remember? Well, last night, he totally revolutionized my blog by showing me the amazingness of Picasa. 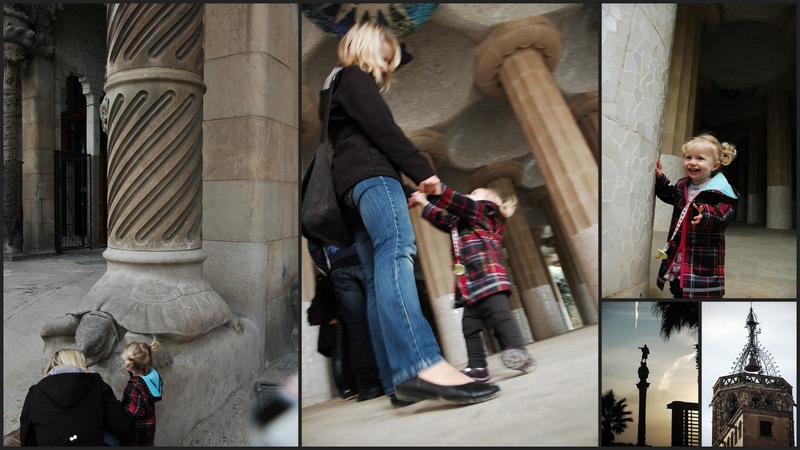 Seriously, I formatted all of these Barcelona photos in under 10 minutes. TEN MINUTES!! That used to take me so long in PowerPoint - so embarrassing, so true. 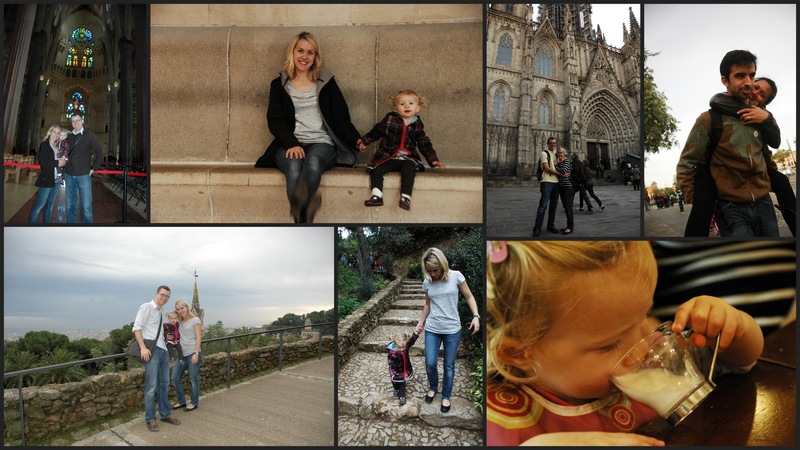 Okay, so the highlights of Barcelona, hence these photos, were the Segrada Familia, Parc Guell, and the Barcelona Cathedral. Elizabeth loved to run around the vast space of the Segrada Familia, and figured out on her own that there were turtles supporting the massive columns outside. She danced to the music of buskers in Parc Guell - there is this covered area that has amazing acoustics, so a bass and piano sounded unbelievably rich and full. The park is full of cobbled staircases and funky architecture by Antoni Gaudi - also the designer of Segrada Familia - also the origin of the adjective 'gawdy'. Everything is a little bit over the top. Seriously? 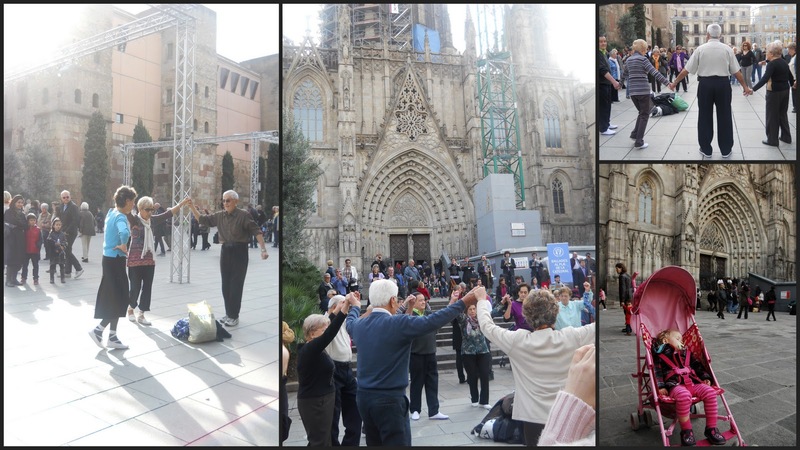 Old people dancing in a circle to music played by a brass band in front of a really old church? I love it!!! The ladies all had special shoes too - look closely, they're all bright white lace-ups. And the weird thing was that it was only for this one song - maybe it was an anthem or something? Anyways, they were just regular old people, touristing it up, and then this song came on, and they put their shopping bags down on the ground, changed their shoes, and BOOM, you got a dance floor started. I was totally mesmerized. And then as soon as the song ended, they just changed their shoes and went on their merry way... ??? Anyone know what this was all about? I'm taking an evening Spanish class - but I have not learned how to ask, "What is this odd custom of dancing to a specific song in front of this church? Is this the Spanish equivalent of a flashmob?" In order to fulfill our motto of "Keep Elizabeth Happy", we stopped at a lot of playgrounds and parks throughout the weekend. 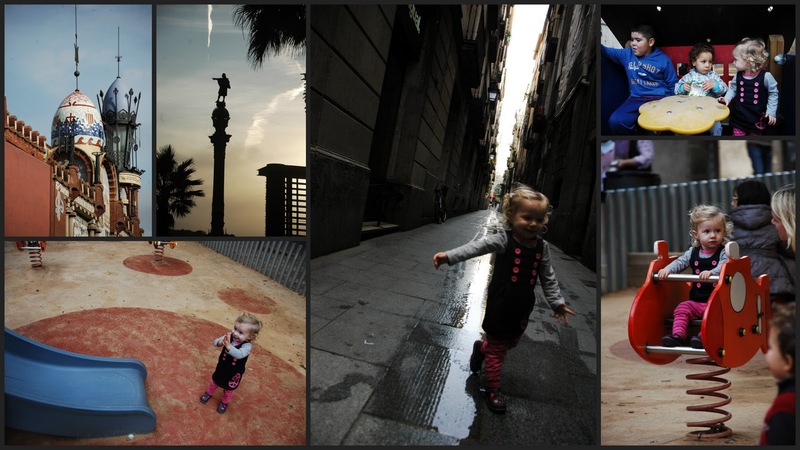 Barcelona has a ton of little neighbourhood parks, full of super cute little Spanish kids, yelling, "Mama! Mira, Mama!! Mira, mira Mama!!!" Translation: "Mommy! Look at me Mommy! Look Mom, look at me!" It's so encouraging to know that 'conversation' happens all over the world. Language barriers don't exist when you're under 5, and so not only did Eliz make friends with these 3 boys, the littlest one shared his potato chips with her. It was her first holiday fling. 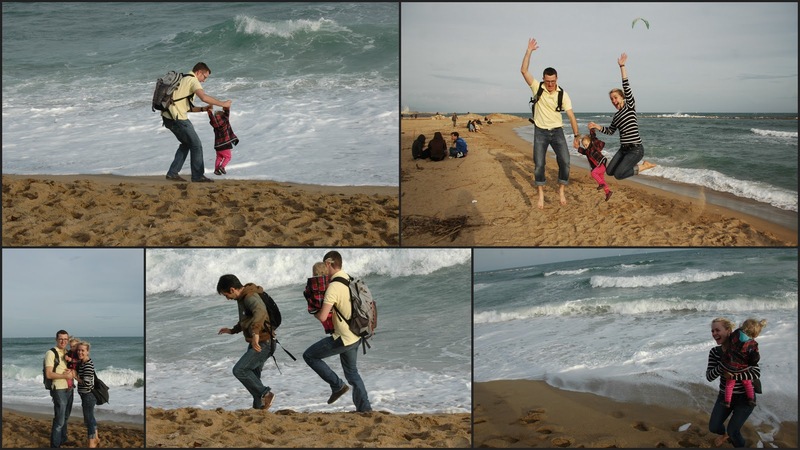 No holiday to the sea is complete without at least a little bit of wading. The water was freezing, so swimming was completely out of the question - even though I optimistically packed bathing suits for us. Elizabeth was more than content to run up to the wave and then run away screaming. I love the shot of Stu and Matthew both backing away at the same time to save their shoes. They must be good friends - they even run away in sync. So I guess if you ever have the chance to pop over to Barcelona for the weekend to meet up with your friends from Canada who live in Kuala Lumpur, you should probably just do it. You won't regret it.